Pumpkins are readily available in fall, when people carve jack-o’-lanterns out of pumpkins for Halloween or serve up pumpkin pie after a hearty Thanksgiving dinner. 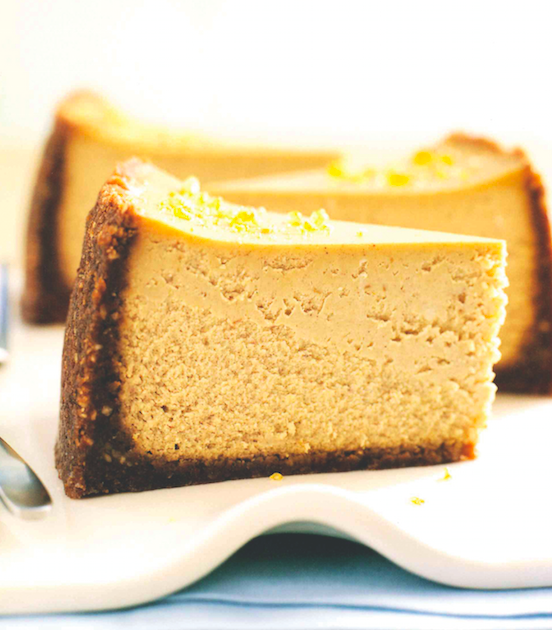 But people who are unsatisfied with plain old pumpkin pie can add something new to their repertoire this fall by cooking up the following recipe for “Pumpkin Cheesecake with Gingersnap Crust,” courtesy of Lori Longbotham’s “Luscious Creamy Desserts” (Chronicle Books). 1. Preheat the oven to 350 F. Lightly butter an 8- or 81/2-inch springform pan. 2. To make the crust: Stir together all of the ingredients in a medium bowl until the crumbs are moistened. Press the mixture over the bottom and up the sides of the pan. Bake the crust for 10 minutes. Let cool completely on a wire rack. Increase the oven temperature to 425 F.
3. To make the filling: With an electric mixer on medium speed, beat the cream cheese, brown sugar and granulated sugar in a large deep bowl until light and fluffy. Beat in the eggs and then the egg yolks one at a time, beating well after each addition. Add the flour and pumpkin pie spice and beat on low speed until just combined. Add the pumpkin purée, créme fraîche and vanilla, and beat until just combined. Pour the filling into the shell. 4. Place the cheesecake on a baking sheet and bake for 15 minutes. Reduce the oven temperature to 250 F and continue baking for 1 hour. 5. Turn the oven off and let the cheesecake cool in the oven for 21/2 hours. Then transfer to a wire rack and let cool to room temperature. Refrigerate, tightly covered, for at least 10 hours, until thoroughly chilled and set, or for up to 2 days. 6. To serve, run a knife around the side of the cheesecake and remove the side of the pan. Serve slightly chilled or at room temperature, cut into thin wedges with a sharp knife dipped into hot water and wiped dry after each cut. Pour the cream into a glass jar with a tight-fitting lid and spoon in the créme fraîche. Let sit on the counter, with the lid slightly ajar, until the mixture thickens, from 4 to 24 hours, depending on the weather. Refrigerate, tightly covered, until ready to use.